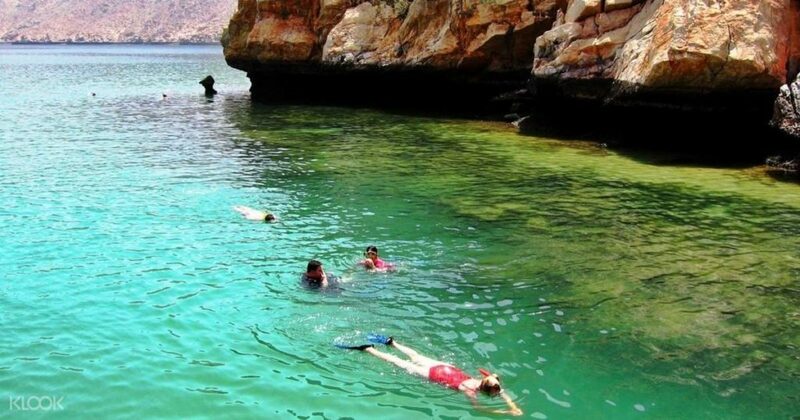 Musandam Khasab half day dhow cruise is brief however full action packed trip chance to see dolphins, swimming and snorkeling and visiting historical Telegraph Island. Throughout the trip you will discover different fishing villages like Nadifi, Qanah, Maqalab, Sham and Seebi only accessible by boat. The Dhow anchors at the famous Telegraph Island wherever you can swim and snorkel within the crystal clear water. Telegraph Island is that the place was a station for the telegraph cable linked from London to Iraq southern city of Basra and onwards to Bombay, India in 1864. The station was then moved from Musandam to Hengam in Iran (Persia).Join our Musandam half day Khasab dhow cruise to explore the historical Telegraph Island and the view of breath-taking Musandam Fjords. 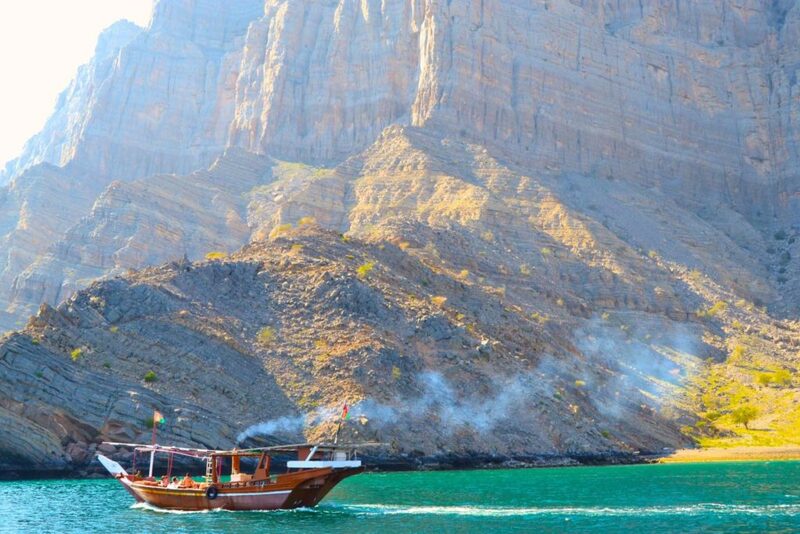 Sailing on the traditional Omani wooden dhow and enjoying the view of Musandam Fjords, is amazing and fantastic itself. 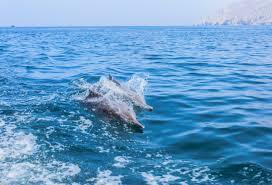 Dolphin Travel & Tourism offers a unique chance to view the scenic beauty of Khasab Musandam. Enjoy the adventurous and unforgettable experience with Musandam Khasab Half Day Dhow Cruise into the fjords of Musandam. Khasab Musandam Traditional Omani boat has been modified nicely to provide all the required amenities provide with carpets, luxury seating, snorkeling gears, life jackets and on board refreshments. Guests can choose to sit on comfortable dhow boat and have an ideal view of the sightseeing’s such as natural dolphin watching, sea cliffs, fisherman villages within the heart of Khasab Mountains and telegraph island. What can be more adventurous and fantastic than watching natural and wild dolphins along the way ? Following the dhow, racing the dhow, jumping and playing it is nothing other than the most amazing dolphins do. They are ready to make your day more enjoyment. Our staff is ready to serve you coffee, tea, omani qawa, mineral water and fresh fruits (Apple, Banana and Orange) on the boat. 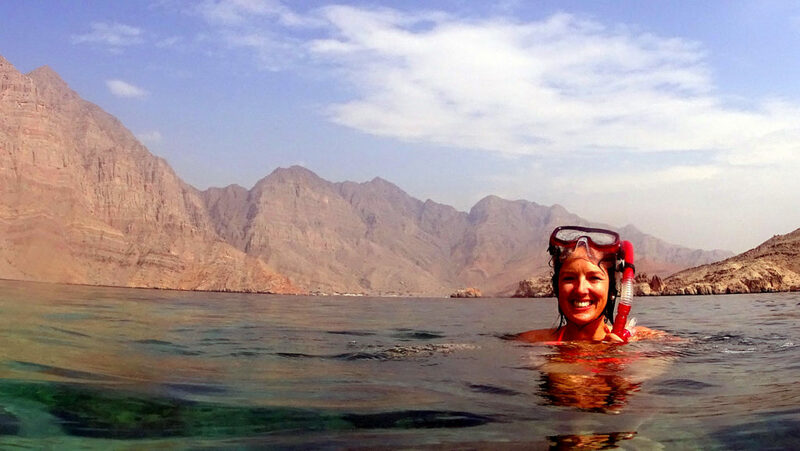 Get ready to book the Musandam Khasab half day dhow cruise with us? Half Day Schedule: 9:00 AM - 1:00 PM & 1:30 PM - 5:00 PM. Three hours sharing Musandam Khasab Half Day Dhow Cruise to historical Telegraph Island & fjords. Natural and Wild Dolphin watching, swimming and snorkeling in Telegraph Island and view of fisherman villages inside Musandam fjords. Swimming and Snorkeling gears, life jackets, towels and comfortable sitting arrangements. One stop for swimming and snorkeling at Telegraph Island inside fjords it will be anchors 1 hours. View of small fisherman villages within the fjords like Qanah, Maqlab and Shem they accessable only by boat. 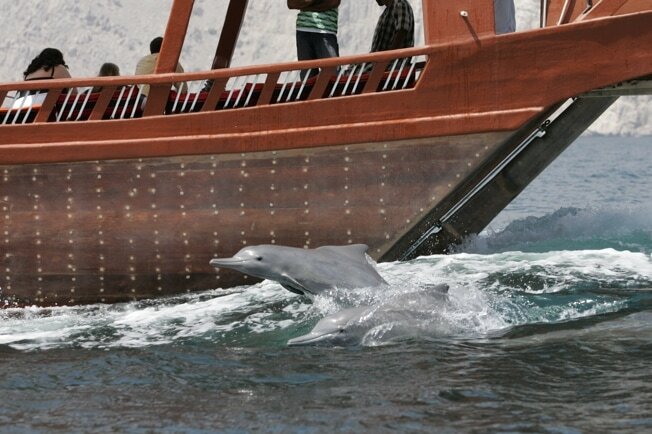 An unforgettable Khasab Musandam dhow cruise with dolphin watching and swimming and snorkeling in musandsam fjords. 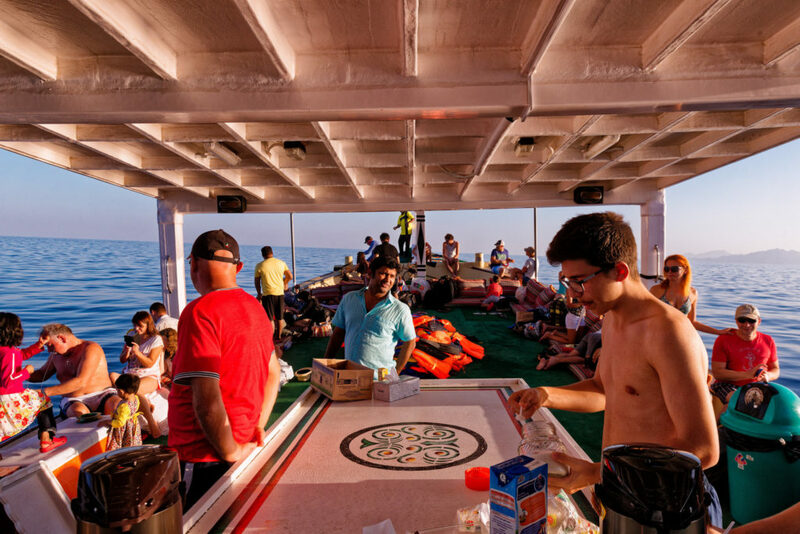 TOUR START TIME – 09:30 AM MORNING – 01:30 PM AFTERNOON: Half day Khasab Musandam dhow cruise morning session starts by 09:00 am to 1:00 pm and afternoon session starts by 01:30 pm to 4:00 pm, so that make sure that you are on time to join our tour. Our friendly staff can served you soft drinks, drinking water, fresh fruits (Apple, Banana and Orange), omani qawa, coffee and tea. DOLPHIN WATCHING – 10:45 AM MORNING – 02:15 PM AFTERNOON: In Khasab Musandam half day dhow cruise the most adventurous and amazing acitivity is the Dolphin Watching. Dolphins follow our dhow and make racing, jumping and playing with us. So there are around 90% probabilities to see them along the way as these are not trained ones they are wild and natural dolphins. TELEGRAPH ISLAND – 11:30 AM MORNING – 02:45 PM AFTERNOON: Telegraph Island is the historical place and the famous landmark of this area and it is best places for swimming and snorkeling. The dhow will anchor for swimming and snorkeling for 1 hour here and you can enjoy and fun. Snorkeling gears and life jackets will be available on the boat, thus you will take that fits you well. REACHING KHASAB PORT – 12:30 PM MORNING – 04:30 PM AFTERNOON: We will spend around one hour for swimming and snorkeling in Telegraph Island and return back to Khasab port. It takes almost 45 minutes to reach port from Telegraph depending upon the sea conditions. Telegraph Island also known as Jazirat al Maqlab. The famous landmark in this area. Here the British government laid the first telegraph cable in 1864, it ran from Bombay, India to Basra, Iraq and onwards to London, the island was manned for around 10 years. 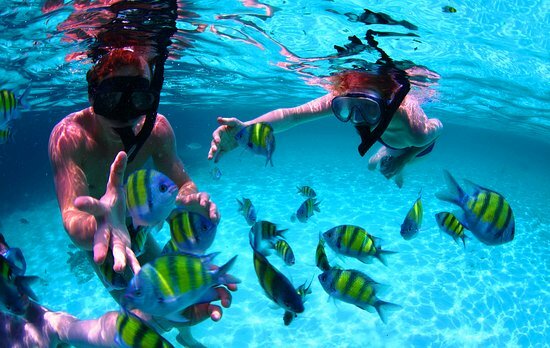 Swimming and Snorkeling in the crystal clear water is a memorable treat here. Watch out for butterflt fish groupers, barnacles, urchins and the coral growths by using goggles and masks are among the best in this Fjords. © Copyright - The Dolphin Travel & Tourism.